The Tektronix 7104 is a 1 GHz, non-storage 7000-series oscilloscope mainframe that takes two 7000-series vertical plug-ins and two 7000-series horizontal plug-ins. It was introduced in 1978. There is also a rack-mount version, the R7103, albeit with only one horizontal bay. The scope employs a micro-channel plate (MCP) CRT design to get good screen intensity at high sweep speeds with moderate acceleration voltage. The high speed necessitated using distributed deflection plates also for the horizontal deflection system, which reaches a bandwidth of 350 MHz. Option 2 adds a horizontal delay line to make the high horizontal bandwidth available for X-Y mode at a phase shift of <2° up to 50 MHz, nullable at any frequency up to 250 MHz. The 7A29 1 GHz vertical amplifier and the 7B15/7B10 time base pair were introduced along with the 7104 to match the system bandwidth. The Micro Channel Plate's amplification degrades irreversibly with operation, in proportion to the log of total charge passed per channel or display area. For this reason, continued operation with a steady trace and especially at large beam currents must be avoided. The 7104 contains a "limited viewing time" circuit to assist with observing this restriction. At beam currents above 0.2 μA, a yellow indicator illuminates, and the beam will be shut down after 20 minutes. The limit time drops to two minutes at an average beam current of 2 μA, and also limits the average current to that value. Single-shot display current is not affected. 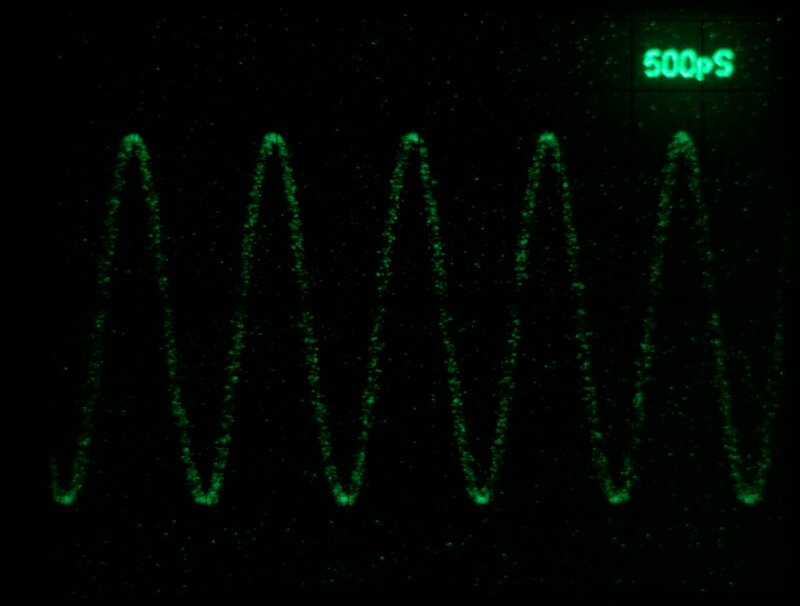 Despite this limiter, older instruments often exhibit darkening of the screen around the horizontal center line to some degree (see screen shot). The 7104 makes extensive use of custom integrated circuits and hybrid circuits, inter alia, the 155-0174-00 Delay Line Compensator, 155-0173-00 Vertical Channel Switch, 155-0176-00 Vertical Output Amplifier, 155-0194-00/01/02/03 CRT Termination, 155-0175-00 Trigger Amplifier, 155-0178-00 Horizontal Output Amplifier, 155-0012-00 Z-Axis controller/amplifier, and 155-0067-02 SMPS controller. The high-speed amplifiers use Hypcon ceramic packages that use elastomer-based frames for coupling chip connections to the circuit board at constant impedance. The signal connections are differential throughout, and the signal path was optimized for matching and low reflection, including the plugin to mainframe card-edge connectors and the use of stripline and coplanar waveguide techniques right up to the CRT. The 7104's amplifiers use a then novel scheme of "feed-beside" compensation (US Pat. 4.132.958) where instead of matching the HF response to the LF response, the LF response is determined by off-the-shelf operational amplifiers in parallel to the high-speed amplifiers, with a number of adjustable R-C time constants to compensate for thermal and other LF effects. The same technique is employed in the 7A29 amplifier plug-in. The 7104 uses a switch-mode power supply. Module A23 (schematic page <14>) contains the mains rectifier, base drive circuitry, and power transistors of the inverter (aka, switcher). These transistors produce a 25 kHz waveform that is fed to the primary of T1310, whose secondaries provide the power for the rest of the scope. Module A24 (also on schematic page <14>) contains the inverter control circuit and rectifiers for the secondaries of T1310. The inverter control circuit uses the 155-0067-02 inverter control IC, which is U1275. Module A25 (schematic page <15>) contains the low-voltage regulators. There are independently regulated and current-limited sections for the -50 V, -15 V, +5 V, +15 V and +50 V rails. Each section has an opamp and a BJT output transistor in emitter-follower configuration. The opamps need power, too. To avoid a dependency cycle, the power supplies for the opamps are separate low-current, low-efficiency zener clamps that in no way depend on the -50 V, -15 V, +5 V, +15 V or +50 V regulators. The power supplies for the opamps produce -22 V, -5.6 V, +5.6 V, and +22 V. To avoid exceeding the opamps' limit of 30 V total rail voltage, each opamp either gets -22 V and +5.6 V, or -5.6 V and +22 V, depending on whether it needs more output swing in the positive or negative direction. The +50 V section is produces the reference voltage for the other sections. It uses a 9V zener diode, VR1412, as a reference. The semi-regulated rectifier outputs depend only on mains power to enter tick/burst mode. However, to enter normal mode, a variety of things need to be working properly. The upper half of the 7104 can be tilted upward for service. A metal support is included, like on the hood of a car. Rise time measurement as before, 1000 Hz repetition rate at same brightness settings. 7104 recording a single shot pulse (from 067-0587-02) at 200 ps/Div. Camera: Nikon D7000, 50 mm f/1.4, ISO 3200, 1/2 s. CRT filter not removed. 7104 recording 1 GHz sine, single shot at 200 ps/Div. Camera: Nikon D7000, 50 mm f/1.4, ISO 3200, 1/2 s. CRT filter not removed. CRT amplification loss is evident around the center line. This page was last edited on 23 March 2019, at 20:53.